Starting with Nicholas Carr in 2013, it has become a biannual tradition for someone in the media to proclaim that print isn't dead, and that ebooks are declining. The last publication to cheer on the revival of print was The Guardian, which proclaimed in April that paper books were opening a new chapter, and now the NYTimes has picked up the standard. Yesterday the NYTimes announced that print was far from dead and that due to declining ebook sales, the expected digital apocalypse had been indefinitely delayed. Yeah, those sales stats don't mean what you think they mean. The 1,200 publishers represent less than half of the industry's ebook revenues. According to the AAP's year-end report, the 1,200 odd publishers generated $1.58 billion in ebook revenues in 2014. That is a lot of money, but not in comparison to the AAP's figures for 2014 ebook revenues for the trade publishing industry. You see, the AAP collects and releases revenue data from 1,200 publishers on a monthly basis, but they also publish an annual estimate that covers the entire trade publishing industry. That annual estimate is called Statshot Annual. According to the figures released in June 2015, the total 2014 ebook revenues for the trade publishing industry were an estimated $3.37 billion dollars. The share represented by the 1,200 publishers comes to 46% of that $3.37 billion, in case you were wondering. While I'm sure some readers are thinking that you can reasonably extrapolate from a limited data set to the entire market, that will not work in this case because the 1,200 publishers are not a representative sample of the market. There's a fundamental difference between the AAP's data and the non-AAP industry. While the majority of the AAP monthly data about ebook revenues comes from the Big Five US trade publishers, the majority of the non-AAP ebook revenues goes to self-published ebooks and indie published ebooks. That difference is especially important because the Big Five are the same five publishers which negotiated agency contracts last fall and spring, giving themselves more control over their ebook prices. According to the WSJ, the new contracts resulted in higher ebook prices and fewer ebooks sold. Edit: And here's why those publishers pushed for higher ebook prices. And it's not just the WSJ; there's independent confirmation in terms of ebook sales in the Kindle Store. According to the Author Earnings report, the share of Kindle ebook unit sales represented by AAP members has dropped from 45% to 32%. You can find more data on average ebook prices for Amazon, indie, and self-pub ebooks over on the Author Earnings website. While you're there you should also look at the report that the Big Five have been increasing the average price of their ebook for over a year. The data shows that the publishers sending monthly sales data to the AAP are selling fewer ebooks, so it should come as no surprise that their sales are down. But it does not follow that the market as a whole is down. To look at the AAP data and say that the ebook market is down is an example of wishful thinking, confirmation bias, or what have you. But no matter what the motivations, the simple fact is the data does not support the claim. And as for the rest of the NYTimes piece, that is just window dressing. I was amused by the Randy Penguin brag that they had just opened a new 365,000 square foot warehouse, “doubling the size” of the facility. Not mentioned: the new “addition” is actually a *replacement* for a bigger facility, over 440,000 square foot being closed. So their net capacity for pbook warehousing actually declined. But hey, its the NYT. Cherry-picking facts is SOP, no? I guess all I can say about this “reporting” from the NYTimes is… I’m sure enjoying my Washington Post digital subscription. Thesee ebook henny pennies never mention publisher prices. Nor do they mention that in 2006, ebooks were less than 1% of trade press sales. Which is not to say I think print is dead. I think it has a while to go, especially in literary fiction and kids’ books. But what we’re arguing about is how steep is the curve for the digital transition. The sky isn’t falling for print, but it’s not actually nailed up there, either. Not to mention the “fact” that NYT blames the decline of independent bookstores on Amazon like the monopoly of B&N and Borders never have happened pre-Amazon. But hey, if they’re already abusing statistics, why not history too? I have toilet paper better written than the Times. These apologetics for ebooks miss the point. Ebooks have serious issues that should have been addressed by now but aren’t. 1. The heavy-handed dominance of the market by one retailer. 2. The difficulties of creating ebooks that are as attractive, versatile, and varied as print books can be and the adoption of standards that really are standards, meaning they will allow that ebook to be read years from now. 3. Absurd ambiguities about the ownership of all digital media. When I pay Amazon, Apple or whoever for digital media—books, music, apps or whatever—to what extent do I own it versus merely renting it until I die, let some retail account lapse, or the technology changes? Are digital media rented, leased or bought? Can they be sold? Can they be inherited? All those questions remain unanswered and, one suspects, those in this business would rather leave matters that way. 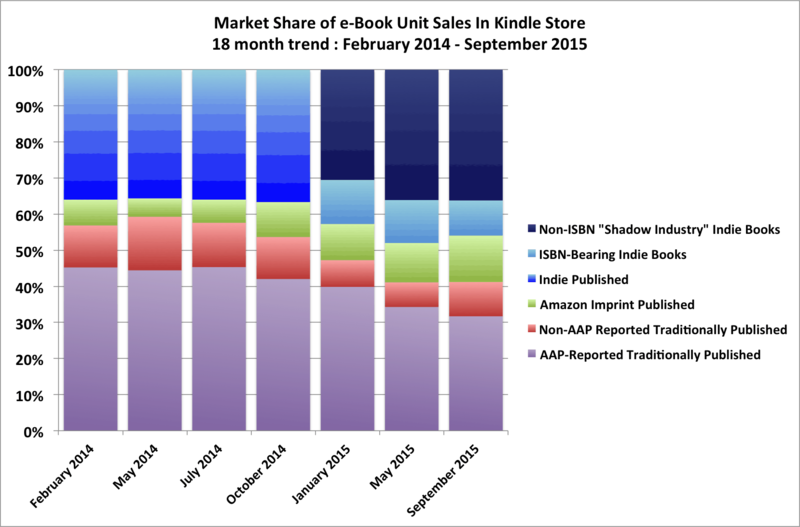 Not addressing these issues doesn’t mean all ebooks sales will languish. For some genres (i.e. romance novels), those long-term factors may not matter. But for books that aren’t read-once-and-discarded they do matter and over time more and more of the public will realize that. In short, fussing over sales figures isn’t dealing with the long-term issues that either aren’t been addressed or are being addressed poorly. This post is not an ebook apologetic, and the points you raise are beyond the scope of the current print/digital issue. If you want to address the issue of Amazon’s dominance, you can do so by launching a competitor that people like more. Good luck with that; it’s harder than you think. The technical issues you raise are just as difficult to address. Look at Epub3, for example. That has shown us that the only way to do advanced and sophisticated formatting is to use a proprietary solution (which doesn’t really work either). To be fair, points 2 and 3 of MWPs comment are not even worth addressing until 1 is no longer an issue. This is absolutely no different than Internet Explorer in the 90s. Web standards were pointless until the market share was sufficiently distributed. And then it took 15 years to fully implement web standards across the web. We’re in year five, essentially, of a 20 year process.